I was awed by the the conventional foods dished out by Dibs, using unconventional cooking methods in record time ! Grilled Akki Rotti with Sprouts is a nutritious, crisp and chewy version of the traditional Akki Rotti that she makes often. My five year old grand daughter loves to take a wedge of this tea time snack to her kindy. It is most enjoyable with a hot cup of 'tea time' coffee ! This is how she prepares it. 1.First mix all the ingredients together except the rice flour. 2.Mix in the rice flour and bind the ingredients together into a soft spreadable dough adding water little by little. 1. 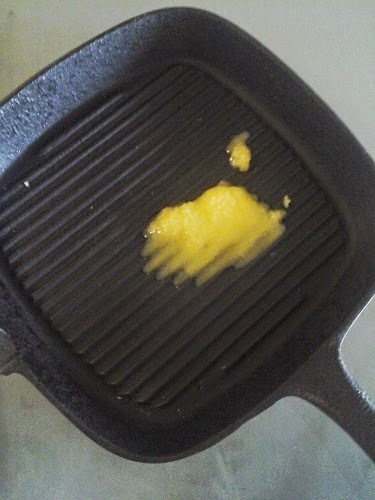 Apply ghee liberally and grease the ribbed cast iron pan thoroughly. 2. 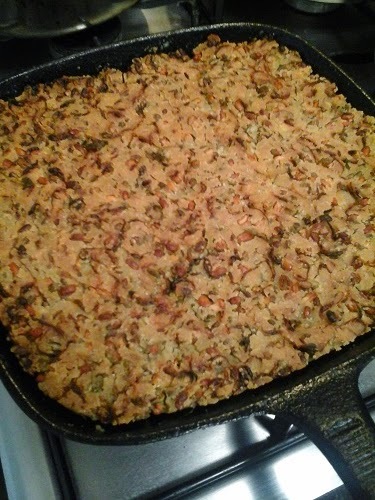 Spread the dough into a one inch thick rotti in the greased pan. 3. Sprinkle some more ghee on top of the spread dough. 4. Grill for 20 minutes or till the Akki Rotti turns into a golden brown colour. 5. When done, remove from the oven and cut into wedges using a sharp knife. Enjoy with chutney or any other spread you like. It tastes super delicious even without the dips. We finished the entire Rotti straight from the oven, before we could even click the cut wedges ! Soups are ideal to sneak in some vegetables into the food for children who are fussy eaters. My five year old grand daughter who does not like to 'bite and eat' vegetables, relished the Almond and Cauliflower Soup very much. 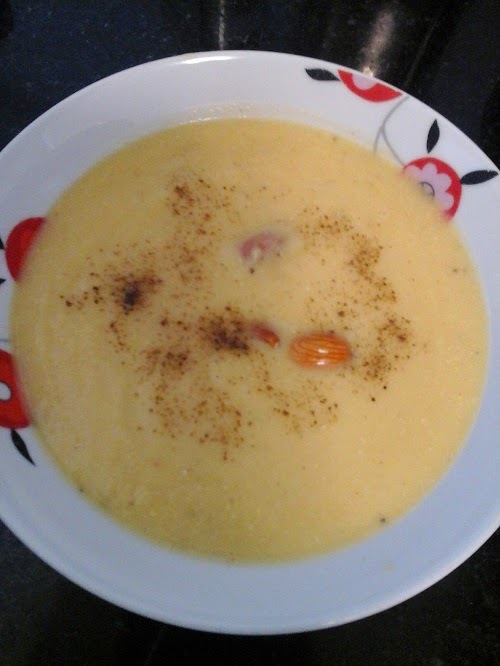 Addition of a small carrot gave a pleasant colour to the soup and also made it more nutritious. 1. Wash and cut the cauliflower into cubes along with the stem. 2. Peel and dice carrot. 3. Heat ghee in a thick bottomed vessel and add cinnamon powder followed by chopped ginger and garlic. 4. Fry them to a golden brown colour and then add the chopped cauliflower and carrot. 5. Cover and cook till tender sprinkling water if necessary. 6. Thoroughly cool the vegetables. 7. Blend the vegetables and blanched almonds together with salt into a smooth paste. 8. Add about 5 to six cups of vegetable stock or water ( or more if a thin soup is required ) to the thick cauliflower paste and cook on low flame. 9. When the soup is about to boil switch off flame. 10 Add pepper and more salt if required. Garnish with a few blanched or roasted almonds and serve the Almond and Cauliflower Soup to that fussy eater !